Let’s face it, once you’re pregnant, you might adopt the “eating-for-two”mentality. Which is fine if you’re focusing on eating broccoli, carrots and cauliflower. Ice cream and French fries? Not so much. Try These Easy Ways to Fight Weight Gain during Pregnancy! When you’re pregnant, you get hungry…often. So chances are you might be hungry when going grocery shopping. To avoid those impulse buys (Cherry Garcia or Chocolate Mint anyone?) you’ll need a plan in hand. So, do make a menu and shopping list for the week. And… do yourself a favor and eat an apple on the way to the store! Plates, like portions have gotten bigger. So when you fill up said plate with a “normal” sized portion of food, that food might look kinda puny there. Who wants their food to look pitifully lonely on the plate? 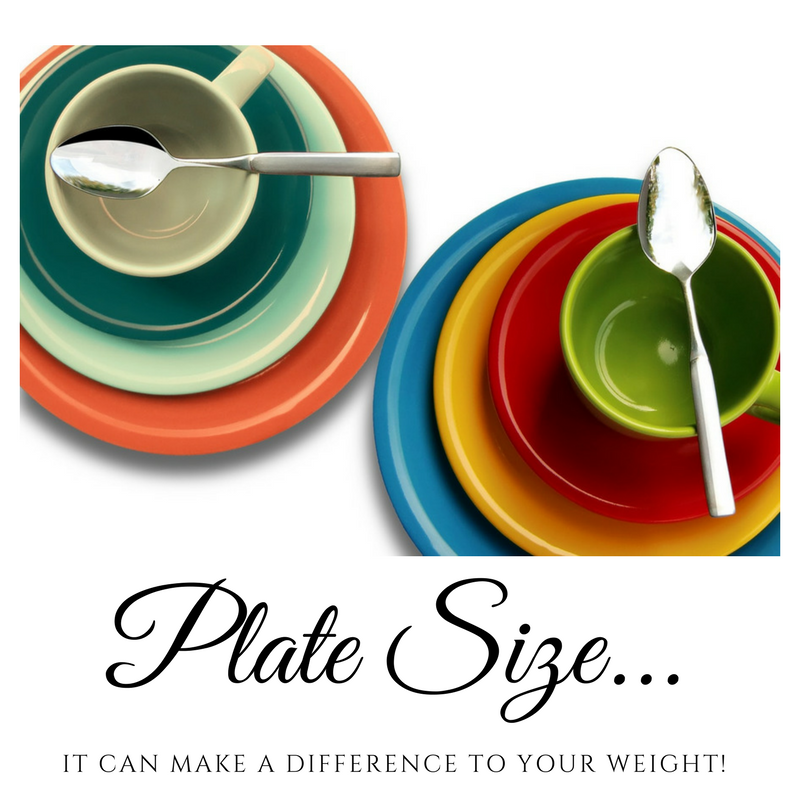 So then there goes an extra dollop of food…Instead, start with a smaller plate, and it will make you feel like you’re eating sooo much–especially if you fill half your plate with veggies! Which brings me to my next tip. Eat a raw veggie before your meal. Find easy ways to eat more veggies here. It’s true that NON-starchy veggies, like green beans, tomatoes, kale, broccoli, carrots and spinach will fill you UP not OUT. 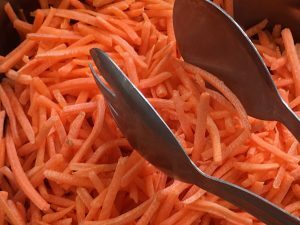 And as an extra bonus, the fiber in veggies can help constipation and feed the good bacteria in your gut. Win-Win. It’s not just distracted driving that can get you in trouble… If you eat while: watching TV, checking in on Facebook, posting on Instagram, reading your email (or all of the above) you are probably eating more than you think you are or more than you want. Why’s that? Your brain can only focus on one thing at a time really, and when you eat while doing something else, the food isn’t as satisfying because you are not totally aware that you are eating. It’s long been known that screen time is linked with overweight in kids, but it’s true for adults tool. (Read a summary of the research here.) 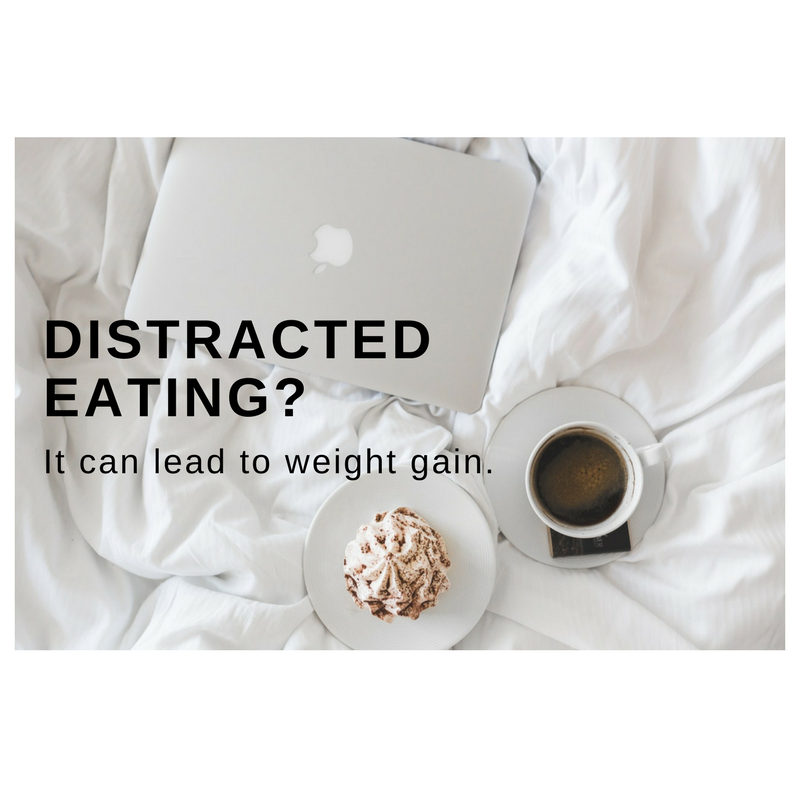 Research in England showed that you tend to eat 10% more when eating while distracted, but because your brain doesn’t totally register what you’ve eaten, you’re also more likely to eat 25% MORE later in the day. 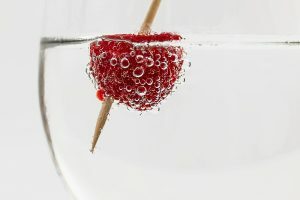 Hydrate Healthfully for Healthier Weight Gain. Drinking enough water and other fluids helps in two ways. First of all, have you ever thought you were hungry, but you were really thirsty? The mind does play tricks like that. So drink up! A big glass of something can keep you from eating the food you crave but don’t want to eat (or you know you shouldn’t eat it). But watch out for WHAT you drink! It’s easy to drink all the extra calories you need as fluid. Since you only need from 300-450 calories at the most in your 2nd and 3rd trimester, it’s super easy. 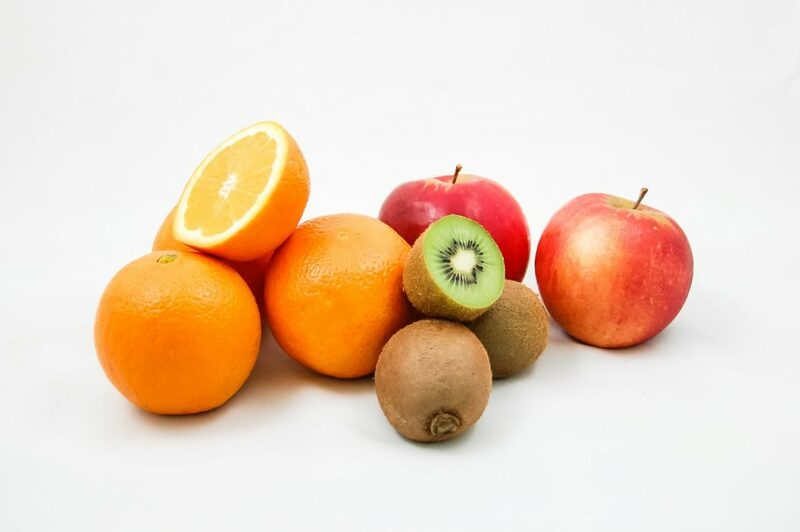 For example, we know orange juice is a healthy way to get your fruit, but a large glass of it has about 220 calories! You’d do better by eating a medium orange–about 60 calories–or adding sparkling mineral water to a half cup of OJ instead. A 12 oz can of soda has about 150 calories–you see how it can all add up. Eating attentively: a systematic review and meta-analysis of the effect of food intake memory and awareness on eating.